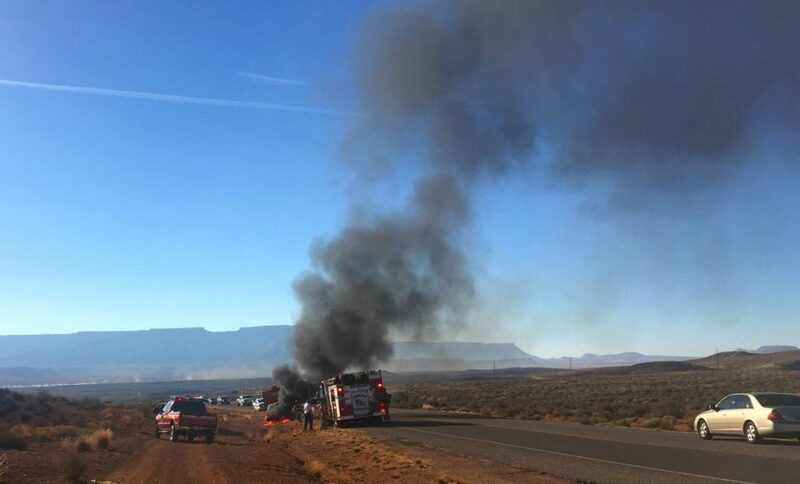 ST. GEORGE — A truck hauling scrap metal caught fire on state Route 9 in LaVerkin Thursday and spread quickly, destroying the vehicle in minutes as responders extinguished the blaze and cleared metal from the roadway. 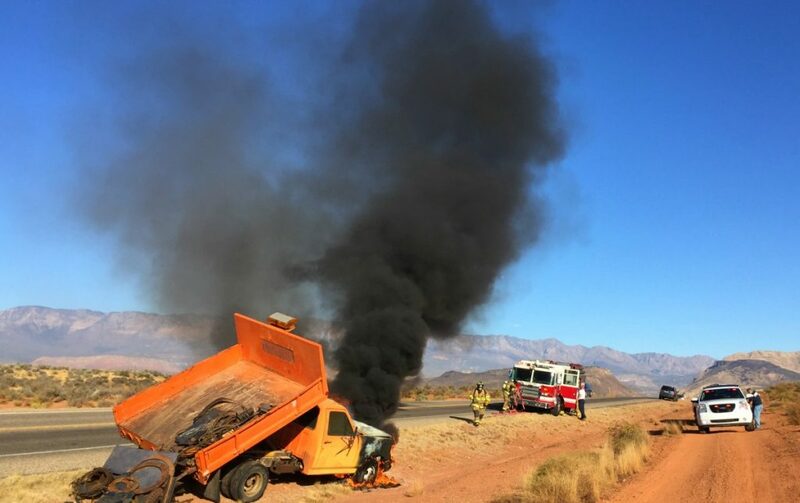 Shortly before 10 a.m., officers and emergency personnel were dispatched to a vehicle fire on SR-9 near LaVerkin Overlook Road involving an orange Rockville city dump truck that pulled to the side of the road before calling 911, LaVerkin Police Sgt. Amber Crouse said. “Once the fire department arrived, they were able to put the fire out very quickly,” Crouse said. The driver told officers he was hauling scrap metal to a facility and going to put fuel in the tank when he observed smoke coming from under the hood. He pulled to the side of the road and saw flames coming from under the hood of the vehicle. 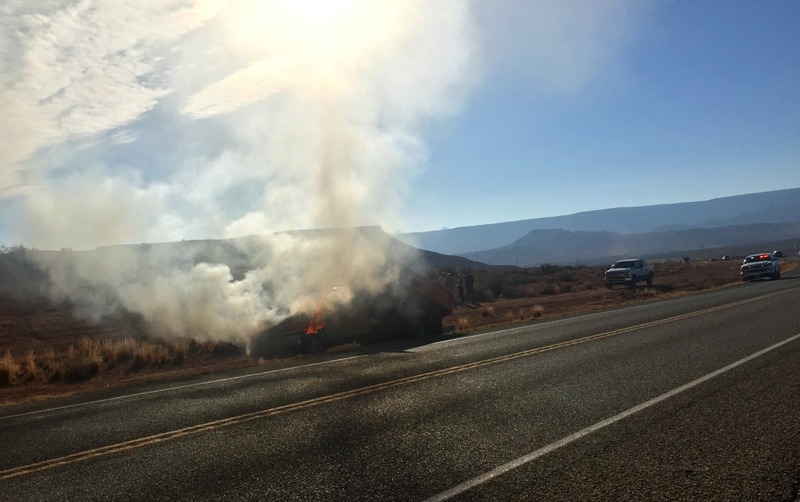 The driver also told officers he believed the fire started in the engine compartment of the truck, but the actual cause is undetermined. 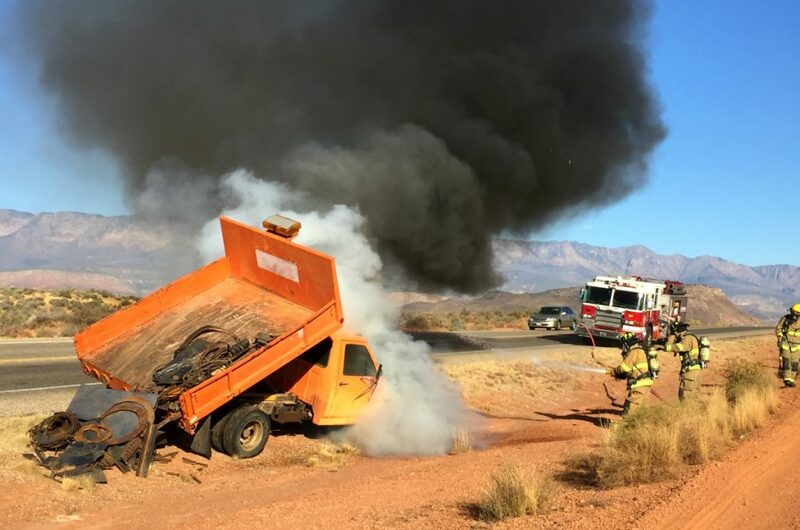 The truck was hauling scrap metal that fell out of the rear section of the vehicle and once the fire was out, a crew from the LaVerkin Public Works department arrived with a backhoe. The scrap metal was cleared away and returned to the rear of the burnt truck. One westbound lane of traffic was closed to allow responders to tend to the scene and remained closed while city employees cleared debris from the roadway. The truck sustained extensive fire damage and was later towed from the scene. The LaVerkin Police Department, Hurricane Valley Fire District and the Washington County Sheriff’s Office responded.